The Great Wall, an epic new film from celebrated Chinese director Zhang Yimou, has a very ambitious visual style and massive scale, both on set and in post. In a recent interview with Art of VFX, ILM’s VFX Supervisor Samir Hoon talked about meeting the challenges of the production and how communication worked between the various vendors spread across the world. How did you and ILM get involved on this show? ILM was contacted by Legendary in early 2014 regarding the project and I met Zhang Yimou at Legendary Studios, in LA, later that year. This followed rounds of bidding and conversations around methodology given the extent of VFX work in the movie. 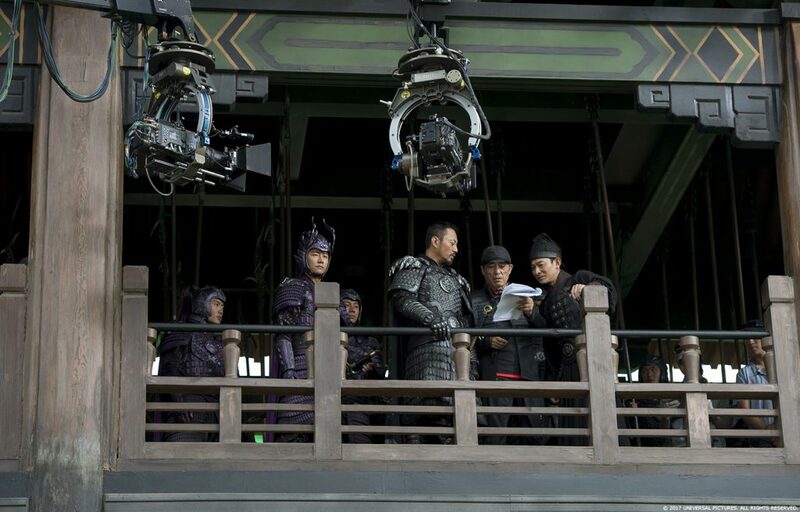 How was the collaboration with director Zhang Yimou and the studio-side VFX Supervisor Phil Brennan? Zhang Yimou is incredibly visual and creative. It was an honor to work with him, he loves epic scale and saturated colors. Since he is most comfortable conversing in Mandarin, all conversations went through his translator but often, his animated style needed no translation. Earning his trust and helping him realize his vision was our goal. After principal photography wrapped in China, director Zhang Yimou and Phil Brennan were based in LA for post. Being 15 hours ahead in Singapore, we would send material our end of day and have daily cineSync reviews the following mornings with Phil, who, would have reviewed the shots with Zhang and gotten his feedback. Overall, the process was very collaborative and both Phil and Zhang were always open to ideas and suggestions. What was their approach to the visual effects? Zhang was clear he was making a fantasy film with monsters and heroes, a Chinese legend set in a world filled with elements of old Chinese culture, surrounded by elite warriors, beautiful landscapes and bloodthirsty monsters. Lots of them. Most action sequences were pre and postviz’d by The Third Floor to help support the shoot, the story and editorial cut. Our main “Wall” set, named “low wall”, was built on the Wanda Studios backlot in Qingdao and was a 100 meter section of the top part of the wall. Around the Wall set we had shipping containers stacked 3 high, onto which green screen was draped. There were also 5-6 heavy excavators with 30×20 foot green screens that could be driven and moved around to help cover areas. It was an all outdoors, massive green screen setup and we faced all the challenges of being exposed to the the elements, one would expect. The Wall set, could fit about 500 extras in costume and it was usually when the cameras went up, we’d realize, we needed more green screen on the ground or objects like crane arms with lights, were visible in frame between actors and the container green screen. If Phil and I felt we needed to fix it, we’d discuss with Stuart Dryburgh (DP) and ZY and get it sorted. We kept our footprint to a minimal but also tried to make sure we got what we needed. The entire crew on set was great and very co-operative knowing what a challenging job lay ahead for VFX. How did you organize the work amongst the ILM offices and vendors? We split the work based on types of shots across the various sequences between ILM Singapore and our vendor partners. 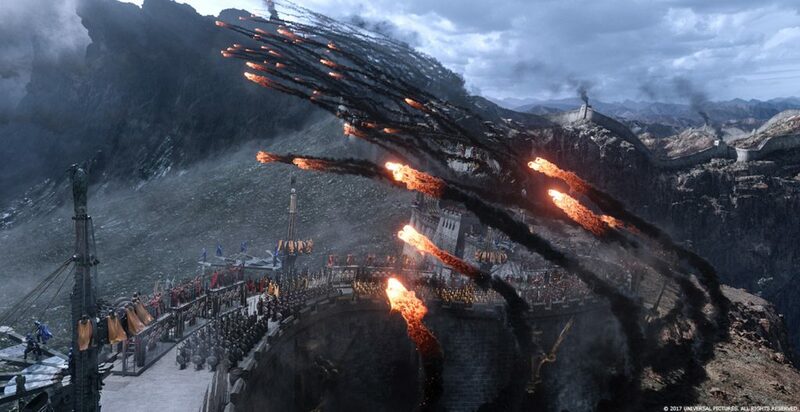 ILM Singapore did most of shots involving Tao Tei animation and creature crowd work. We established the Wall and the “environment look” and shared these massive assets with BaseFX in Beijing, supervised by Jay Mehta and Hybride in Montreal, supervised by Joseph Kasparian. Animal Logic, supervised by Andy Brown, helped out with balloon shots over the city of Bianliang and ILM San Francisco, supervised by Hayden Landis, helped with shots approaching Bianliang. Ghost, supervised by Jacob Borsting, also helped with shots in the balloon takeoff sequence. Ben Snow and I split the Singapore work, and Ben also supervised BaseFX while I managed the work from Animal Logic, Hybride, ILM San Francisco and Ghost. Whilst I was on-set for 5-months, Jeff Capagreco, VFX Supervisor, helped with asset development and set the foundations with BaseFX, Hybride & Ghost. Can you describe a typical day during shooting and during the post? Typically, we’d get in before crew call, look over the set for markers or green screen repairs, go over the scenes for the day, with our on set VFX team and ready our equipment. 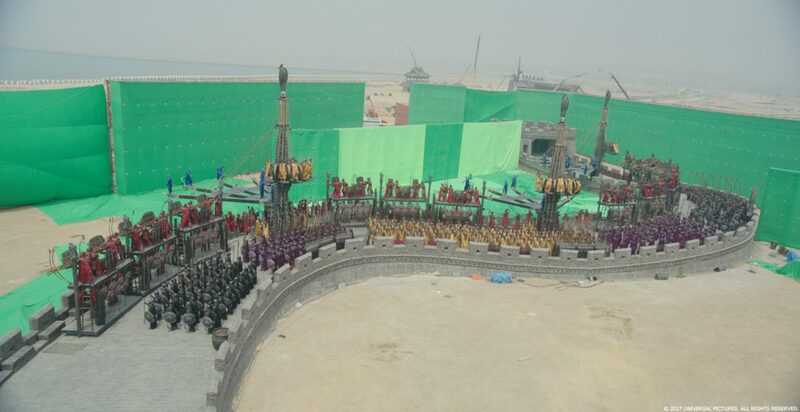 Zhang Yimou would arrive at call time, walk the set, go over the plan with the AD, DP, camera dept, Stunts, SFX, VFX etc. and off we’d go. At the end of the day, the HOD’s along with Zhang Yimou would stay back and go over the next day’s shoot schedule, review any pre-viz and plan and discuss each dept’s needs. When two units were shooting, Phil and I split up and I went with George Ruge, second unit director, to the province of Gansu to shoot the opening sequences of the movie. The location, was a 2.5 hour drive, each way, followed by a 10-12 hour shoot day in the hot, dusty desert environment, so the days were long but the locations at Zhangye Danxia and Yadan geological park were spectacular. During post, a large part of the time was spent reviewing work dark review rooms. We’d start with cineSync with LA in the morning, followed by internal shot reviews throughout the day, followed by reviews with BaseFX, Animal Logic and Ghost in early evening and ending with Hybride later in the evening. The rest of the article is available at Art of VFX and as always, is well worth a read!